Looking at a workshop diagram of the gearbox, the thrust loads from the pinion gear are fed into the case via the centre plate. It doesn't matter where the thrust bearing is on the output shaft, so long as the shaft, bearing mounting point and the case in general are suitably rigid. Your idea about an additional bearing near 2nd gear is interesting, tho. The shaft is pretty thin in that area and may bennefit from some extra support. I understand the thrust load goes into the intermediate flange but I feel with the gear sets trying to push away from each other and the added thrust also trying buckle the shaft it would only compound the forces involved. Take a piece of string and lay it straight on the table. Try to push it from one end. Natural tendency to buckle. Up the test and stand a chop stick on the table and put your body weight or part there of on the end now apply some side load( gear forces) and see what happens. I feel by adding a bearing mid way, it will help stop this effect and by moving the load carrying bearing to directly behind the pinion it will eliminate/minimize any distortion being both by load and temp change. By making the plate bolt around the bearing and right at the edges as close as possible to the case walls/Diff bearing. Distortion should be at a minimum. 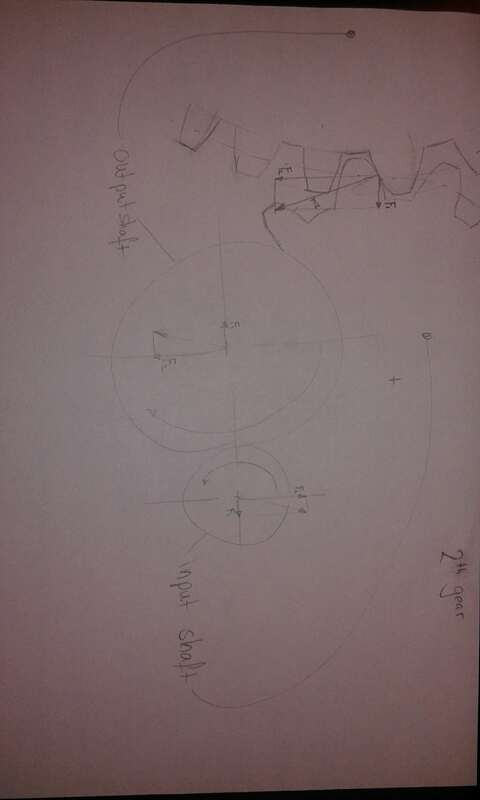 In relation to the pinion alignment. I think it would be about as good as it could get short of making an entirely new case in which case you'd just buy a hewland. The idea is to shorten the load path. As is the case in most modern designs I have looked at. As standard. The load goes the length of the shaft, across the int flange and back a long the case to the diff housing bearings. Any distortion or flex in any part along the way WILL have an effect on pinion alignment. diff, is very difficult because of the depth in the case. Long tools to reach the plane to machine and a thick plate should be used. Is there any room for that? The extra support bearing is a nice idea! But how you gonna mount a support plate? Tryed to weld the case but it failed. Then again i'm not a pro welder. As for the support bearing. No need to attach it to the case at all. It's fiction would be to stop the shafts moving away from each other not tie them to the case. You could machine a small plate the fits between the bearings (think of a letter 'H'with a bearing cap on either end to enclose the bearings. Being rather thin I plan to double bolt each bearing cap similar to a 4bolt main bearing cap in a V8. You could either use long bolts/studs or bolt them into the Centre section. I prefer the idea of long studs with nuts either end or cap screws as there would not be much material to cut a thread in the Centre H section. You could under cut the 2nd and 3rd gears and use a wider bearing, the clamp force of the caps would stop the support from axial wander, say a 10mm bearing and a cap that's 6mm wide. It's only function is to oppose the shafts from flexing. I'm thinking of using chrome moly plate simply from a strength per size factor. For your case bracing have you looked at the diff side plate. The removable one. I know it has a lot of robbing but seeing your int flange you made. I would consider making a revised diff side late which incorporates som mountings for he bracing. As any flex there will also alter the pinion mesh. And also for the other side axle bearing. You could machine a new one the extends forward to incorporate mounting on that side for the brace. I think space is to small for puting in an axtra bearing to connect the input shaft with the output shaft. The bearing needs the same radial load specification as the one in the intermediat flange. This is because it will take most of the radial load of second and third gear. So you can not just put a small bearing in there.. Yes space is at a premium for adding a bearing. But it is possible with some careful machine and spacing/moving of gears. I don't think the radial load will need to be that hi. It's only helping not the primary load carrying bearing, in theory it would only have a load applied under hi power situations when the shaft would be deflecting, most of which would be supported by the original bearings like a standard trans, this bearin would only be aiding/assisting during extreme conditions. I don't agree on that. Look at it this way. It is like standing on a beam with three legs. The one in the midle, where you stand closed to is gonna carry most of the load. Not the one at the ends. Yeah I agree with that. Using your example. If the same beam had only 2 legs, and 100kg in the middle assume each leg carries 50kg. If you placed a third leg in the middle at the load it theoretically would carry 33kg as would the other 2, 'if' the beam had infinite stiffness. But we know it will have some bend/flex etc so it will be a little higher. In our case. If machined accurately the Centre bearing would carry neglible load as the shaft should be running true and our new bearing should be virtually idle under most conditions, until enough force is applied that the shaft would normally start to deflect then our new bearing would start taking up some of that load. Not only taking away from the end bearings but also maintaining shaft alignment. Just my theory and ideas on how it would work. 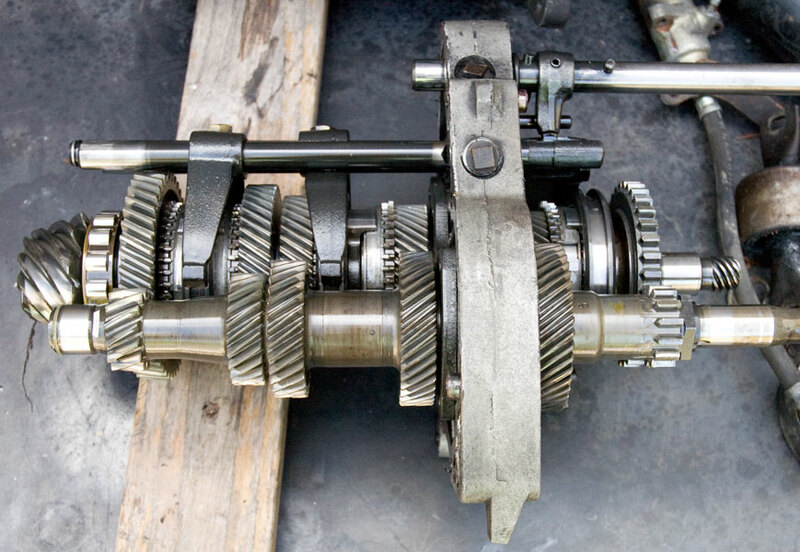 After studying many successful gearboxes I've noticed that most seem to use many bearings close together unlike our gearbox that has bearings at a fair distance apart as well as the main shaft serving 2 purposes and also taking the load of the pinion pushing forward only complicating the matter. Compressive force on the shaft and side loading at the same time on a long shaft with bearings far apart... Ok for its intended purpose but not hi power racing. It's the nature of the synchro design that is at fault in that it is a parallel type synchro, you must move the hub the full width of the synchro to achieve engagement or dis-engagement unlike modern cone type systems that can move bearly a mm or so and go from free to locked solid. Adds length to the whole system but we are stuck with it and have to try and overcome it any way we can. I discussed the problem today at work with or engineer. And he is a verry good one! He sad almost all power is translated in the extra bearing.. It is to the fact that even a small movement in axle centreline displacemt, beacuase there isn't any room to displace, will not bent the axle becuase of the third bearing. So the other bearing don't carry the push away from each other load. But now the good news. Those forces are small in the plane that pushes the axles away from each other. So we can get away with a small bearing! Force F2 bends the axles in the other plane and is the big force where alfa engineers calculated bearing load for. So if we only have to support F1 we can get away with a small bearing. That's nice! The F2 force is translated in twisting the axles around each other instead of flexing away in the F2 force direction because they are tied together. Nice work. I agree, I think that f2 would be the biggest force but have the least effect as well. For that to happen the shafts would have to stretch in length which is unlikely, and if they do then there is very little we could do about it other than tie the new bearing to the case somehow. Which would be rather difficult. I believe a floating tie/support to keep the shafts at a set distance apart would be the best bang for buck/effort. Measure results of the billet aluminium plate are a 37.5% increase in bent stifness.About 0.045 movement That's not bad. I aspected a little more because of the better material and the not weight saved part. gtv-racer wrote: Measure results of the billet aluminium plate are a 37.5% increase in bent stifness.About 0.045 movement That's not bad. I aspected a little more because of the better material and the not weight saved part. Would it be worth while to make a new bearing retaining plate from a higher strength, stiffer material (Titanium maybe) and make it as thick as possible? So if we want more improvement whe surely have to switch material. And then watch the E-modules number. So either make an alloy steel 1 of go completely mad and actually create a carbon fiber bearing plate???? If it was made solid like your custon plate, it wouldn't be very light. But it would resist deflection like (basically) nothing else! How thick is the central plate? I think the studs i might place are making the new plate a lot better. But there might be a room issue... it is crowded in there.